My boss has been supportive of my love for open-source, but I've never really been able to make him understand what makes it commercially viable. I think I finally blundered across the right analogy, though. Simon and Schuster could develop a proprietary written language for their authors to write fiction in. Then, they could try to persuade people to learn Simon-and-Schusterese in order to read their books. In fact, if they did a fantastic job of marketing, they might persuade people to buy the right to learn Simon-and-Schusterese, then buy the books. Meanwhile, their legal department would chase down anybody using Simon-and-Schusterese without proper payment and licensing. Random House, HarperCollins, etc. could do the same with their own proprietary corporate languages. It's vastly more practical, though, for everybody to write in - and sell in - a language that nobody owns, everyone can use, and everyone contributes to. Of course, in the real world, shared human languages came before publishing companies. But if, somehow, things had happened the other way around, you can see how there would be some initial skepticism (What? Give away our language for free? When we could charge money for it? ), but companies that started working with a shared language would eventually dominate, and society would be much richer and more literate for it. 2. Run a session of your application. Run all the commands you want to test. 3. Cut-and-paste your entire session into exampleSession.txt. Ta-da! cmd2 runs runs your app, issues all the commands saved in exampleSession.txt, and verifies that they produce the same output as in your transcript. Now you can change your app fearlessly without bugs sneaking in. Finally, cmd2 is now available for Python 2.4 through 2.6. We are so going to play this game at PyCon. Maybe I'll go to a talk or two, too. Between games. 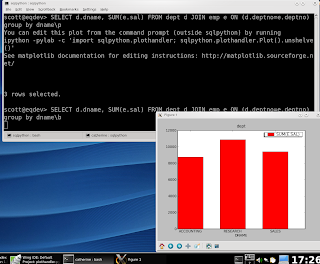 pysql, like sqlpython, is for Oracle only. 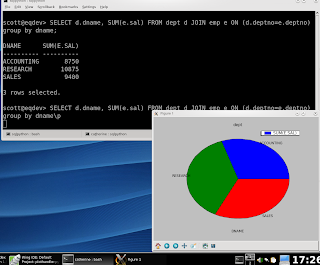 sqlcmd is intended to work across all sorts of database backends (Oracle, postgreSQL, MySQL, etc.) seamlessly. I intend to publicly review them soon. In the meantime, thought I'd let you know of their existence. In my ongoing campaign to teach Python to every multicellular organism in Ohio, I'm bringing my Smash, Crash, Kaboom Course in Python (you know, the one with the exploding planets) to this Tuesday's meeting of the IEEE-Dayton Section Computer Society Meeting. The chapter invites non-members to attend, too; no charge, but $3 to buy into the pizza. The talk materials are here. I have to admit, the first time I heard about people mistrusting computerized voting, I just felt amused. Silly Luddites, I thought. After all, how hard can it be for a computer to count? Really hard, it turns out, if you start with the stupid premise that you ought to write every byte of the software from scratch, incorporating no preexisting software of known and verifiable quality. That's the approach that proprietary vending machine makers have taken - presumably to lend credibility to their patents. There's a new interview with the Ohio Secretary of State, Jennifer Brunner, where she talks very frankly about the serious problems Ohio has found with its voting software. I'm glad Ohio now offers a paper ballot option. I'm going to use it. I truly have no idea what happened to my 2004 vote. There's a perfect solution waiting to be used: PVote by Ka-Ping Yee, one of the Python community's greats. In his interview with NPR's Science Friday, he describes how voting software should and can be written: as a minimal, readable, high-level program that relies on existing open-source components of thoroughly-verified quality. Ka-Ping, my vote is for you. This year, PyOhio decided to buy table space in the nonprofit exhibitors' area of Ohio LinuxFest to publicize PyOhio (as well as PyCon and Python in general). It was a really good decision! The "hallway track" is one of the most interesting parts of any conference, of course, but when you have a table of interesting stuff to draw people in and start conversations about, it goes to the next level. I barely made it into any formally scheduled events at all, and had lots of fun meeting people from the big and growing open-source community. I tried to preserve my voice, but I was half-hoarse by the time my 4:00 talk started. Ponyshow was a big hit - it caught peoples' eye and drew them over to the table. I'd still like to add more flashy graphics to it for next year, though - I ran short on time, and had trouble installing pyglet. Tables in the nonprofit zone lacked electricity, but I used two laptops to get around that - one on display at the table and one recharging at an outlet elsewhere. 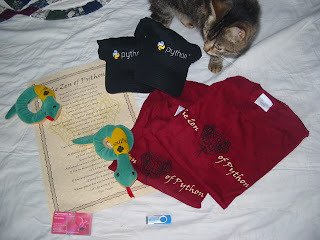 Python stickers donated by PyCon were an even bigger hit. If 1/2 the people who took a sticker are using or will use Python, we've got a very healthy community here! I whipped up a homemade PyOhio banner that went pretty well. I projected our logo onto a wall, traced the outline, used an Exacto knife to make a stencil from the pattern, then used some fabric spray paint. For next year: bring candy. We may see if we can do a swag raffle of our own, too. A rerun of last year's Python introduction went well. The Python Beginners' Hackathon was good, but small. We'll have to think about what might need changes there. I really like the idea of PyOhio running something on the Friday of next year's LinuxFest. Join the pyohio-organizers mailing list to help kick around ideas for that. There was a lot of interest among the attendees. There were more people already actively using Python than I expected, and virtually everyone else knew Python as something they wanted to learn more about. I think we'll see that reflected in an even bigger and more intense PyOhio next year. Thanks to my Ohio LinuxFest audience for learning some Python with me! The talk materials are here. Here's the "Resources for Python Learners" handout. I had a great time at OLF, particularly in the "hallway track"; we have a really fun and growing open-source community in Ohio. Go, us! Ooh - sorry, I got distracted! Here, at last, are the materials for my talk last Saturday, "Into the Dayta-b'hase: A First-Level Introductory Adventure". Citibank spends a lot of time imploring their customers to go to all-electronic statements... but they don't improve their electronic statement availability to make them practical. Ohio Dept. of Taxation spends a lot of time imploring people to file electronically... but they can't be bothered to test their forms, or to provide a feedback button so that end users can notify them of errors they find. This is a bad pattern. If you want people to go electronic, focus on getting it right, not on pro-electronic cheerleading. Ohio has a "use tax" - a law requiring that you add up all your mail-order and interstate purchases from out of state so you can retroactively pay Ohio sales tax on them with your tax return. I think six or seven of us actually obey this law, and the folks at the bureau of taxation laugh, blow a kazoo, and scrawl "PATSY!" on the return whenever they come across someone who paid it. Oh, well. ...and the line to enter your quantity of out-of-state purchases is not editable. It is pre-set to zero and locked. One good thing has come out of tonight: I found wesabe, a really nice site for slurping up records from your various accounts automatically. Next year I won't need to fight Citibank, because my Wesabe account will keep itself updated all year long. Wesabe, I'm happy to say, gets it right. Free services generally do, as opposed to people I pay, who generally get it wrong. It's a strange era we live in. It's official! We have a place, we have a date... now all we need is you! Mendelson's is planning to shrink their store and relocate. This is very sad news. I can only hope they don't shrink too much or move too far. Fortunately, they have no timetable for this move yet, and if we're lucky a giant asteroid will hit the earth and wipe us all out first. If you don't know Mendelson's, the best way I can describe it is "a Jawa sandcrawler parked in downtown Dayton". It's a giant industrial salvage shop, the most amazing pile of thingies and whatsits you can imagine. I consider it the most entertaining location in our fair city. If you can walk through Mendelson's without saying, "MY robot will have THIS! ", then you are already dead. The best thing that can happen, when you try to teach something, is to have somebody learn it and do something that amazes you. That's exactly what happened after my demo of Visual Python at CodeMash... Doug Mair started to play with vPython and came up with two really beautiful examples: a (working!) Rubik's Cube and a set of magnetized disks. As far as I know, the Cheese Shop didn't have any way to handle fractions and mixed numbers... until now. Introducing mixed. You'll feel like you're in second grade all over again! easy_install mixed to get it. I hosted the code on Assembla, which has free mercurial repository hosting, so anybody who wants to polish it up is welcome to! hg clone http://hg.assembla.com/mixed_python mixed_python gets you a copy of the repository. I really enjoyed last year's PenguiCon - science fiction geekery and FOSS geekery make a surprisingly nice combination, with the SF people adding a nice lightheartedness to the atmosphere. 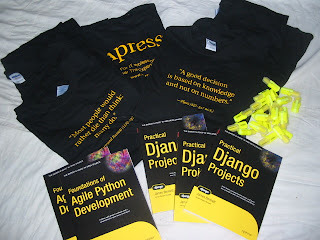 I'm giving a talk again this year, but this time, it will have nothing to do with Python - really! I'm going to try some of that hybrid vigor for my own talk, hoping that a fun theme will leaven a potentially dry topic. Relational database technology underpins modern business, finance, engineering, and a lot of other boring stuff. You know you ought to learn something about databases, but how can you stay awake long enough? Come see database software used for something that actually matters: D&D characters. We'll set up a postgreSQL database, demonstrate all the fundamentals of relational databases, and advance Gruk the Unbathed to 4th level. I'm expecting to be in Washington D.C. on April 22-23, so imagine my delight when I learned of a "Military Open Source Software Conference" at that very time... in that very place! I work on a military contract! What could be better? Now imagine my shock when I went to register. $1.945. For two days. Two days! This, folks, is the problem with conferences run by for-profit training companies instead of volunteer organizations. No, wait, it's just one of the problems. What's wrong with this list? Not one representative of any open-source project! With a speakers' list like that, I don't know if it's even worth pilfering a hotel catering uniform and a pitcher of ice water to go eavesdrop on the talks. Apparently, the topic is limited to decisions regarding open-source at a managerial level, rather than the actual use of the software and participation in its communities. That shows a serious lack of understanding. Breaking the separations between decisionmakers, code-writers, and users is part of what gives open source its power. And suppose you, as an attendee, wish to suggest a topic, present a talk, or facilitate a discussion? Well, you can't. There's no provision for participation by the attendee community. Again, they very seriously do not get it, only seeing one-way relationships from paid content creators to passive content receivers. It seems that, just as "you can write COBOL in any language", you can buy proprietary software under any license. Mercurial won't let me clone into an existing directory. This is a problem when trying to put (only) a subset of files under version control. For example, an Oracle installation includes an enormous directory structure. A few of its files really, really ought to be under version control (init.ora, tnsnames.ora, etc. ); most shouldn't. I need an hg repository in the root of the Oracle software installation. Then, when I set up Oracle on a new machine, I need to clone that repository into the new machine's Oracle root... even though the new machine's Oracle root already exists and is chock-full of files. I'm surprised that there's no --overwrite flag for hg clone, or anything like it, saying "go ahead and clone into that directory even though it already exists." Perhaps it's simply because VC programmers are software developers, used to working with a clean slate rather than configuring an existing directory structure? Anyway, I made up a script workaround. Thanks to the Linuxchix irc channel for helping me figure out the syntax. At last, it's time for DAY-O to meet! A hands-on, cooperative, laboratory-style meeting. Bring a wireless-enabled laptop if you have one. This meeting's topic will be Flashback. Access forbidden. Attempted work detected. The forbidden-content blocker at my worksite is more stupid than the one at your worksite. Doubt me? "Computing/Internet" is one of its forbidden categories. Blogs, another forbidden category, are the biggest problem because, as you know if you're reading this, most of the good code samples in existence these days are on blogs. We aren't allowed to appeal categories, only individual sites. When I whined about it to my boss, he reminded me that I've done some work with web-scraping, and that I could probably write a Python script to make an exemption request for thousands of blogs at once, including ones I've never seen but might Google up someday. It'll benefit thousands of geeks across the organization, and maybe even convince somebody that they should turn the "stupid" dial down a notch. 2. count words. Words that appear much more frequently on whitelisted sites than on blacklisted are positive scorers, and vice versa. 3. apply the scoring vs. unknown sites. Hand-check a lot of results. Beef up the whitelists and blacklists and repeat until the scores against new sites are reliable. One of the best sources I've found so far has been googling for "typical stupid blog". If you're near Dayton, and you have a child, or know a child, or can find a child, or feel like a child, then you really need to get to TechFest! I'm afraid the information technology people haven't traditionally brought stuff with quite the "wow" factor that the physical scientists and engineers bring. What's something we computer geeks could do that would compete with the chemists' goo-making or the physicists' pneumatic implosions? Have to think about that one. 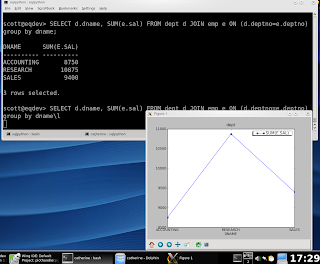 So far, I've taken my smashing-planets introduction to Python to two groups of college students: the Wright State chapter of ACM and an OO programming class at University of Dayton. It's been lots of fun. I appreciate the chance to show young people something I really love, something I think can make their computer work more productive and more fun. My thanks to the folks who decided to invite me and the students who gave me their attention. But. If I don't see a woman student in computer science soon - just, for crying out loud, one woman student - I am going to... I don't know. I'm going to have to research "how to go berserk". What's going on in this country? I think I'd see better gender balance in a classroom in Iran. I wish I knew more about networking. I have a technical need that I can barely describe, much less name. For our new Dayton Oracle SIG, we want to run interactive, laboratory-style meetings. We'll meet in a place with wireless, one member will bring a laptop running an Oracle server and Oracle Application Server, and other members will use their laptops to access it and muck around. This requires the computers using the wireless network to access not just the internet, but each other. I'd call this "peer-to-peer" networking, but it's really "peer-to-router-to-peer". So all we need is a meeting location that allows the same thing. It's not that simple, though. As far as I can tell, the wireless at Panera Bread (my first choice) doesn't permit this kind of inter-machine connection. That locally assigned IP address doesn't produce any response from other machines in the same network; it seems the router simply doesn't route traffic between machines. For security's sake, that kind of makes sense; I wouldn't want somebody hacking my database from the next table over. (Actually, if they did, I'd invite them to the SIG, but that's me.) But it removes some really neat possibilities for interaction. I've found one place so far - the Hope Hotel in Fairborn - where the wireless does allow connections between machines. I was all ready to declare the hotel restaurant our meeting location, until my boss reminded me that it's full of GIANT TELEVISION SCREENS BLARING SPORTS and some people don't tune that out as automatically as I do.